The best wedding photography occurs when a multitude of factors and elements concur in creating stunning images. It is the work of all the vendors involved in the big day. In the morning, during the writing and preparation of this collaboration starts with the makeup artists and hair stylists. During the wedding ceremony, the officiant has an important role in creating a relaxed atmosphere. Having photographed a few hundred weddings in my career, I could tell the difference between an experienced officiant and a novice. Working with an experienced officiant is a pleasure because she can create opportunity for amazing photos. On the other side, the novice is always in photographers way and does not control the flow of the ceremony, which could be disastrous for the big day timeline. During the first kiss, the officiant should step aside so that I can get a clean shot of the bride and groom. The same can be said about the ring exchange when I even encounter situations where the priest blocked my view so I couldn't take the shot. During this Kortright Centre ceremony in the forest and the officiant was flawless. She moved out it my way, prompted the bride and groom to look at the camera when they signed the marriage certificates and so on. This particular photograph is a testament of her professionalism. 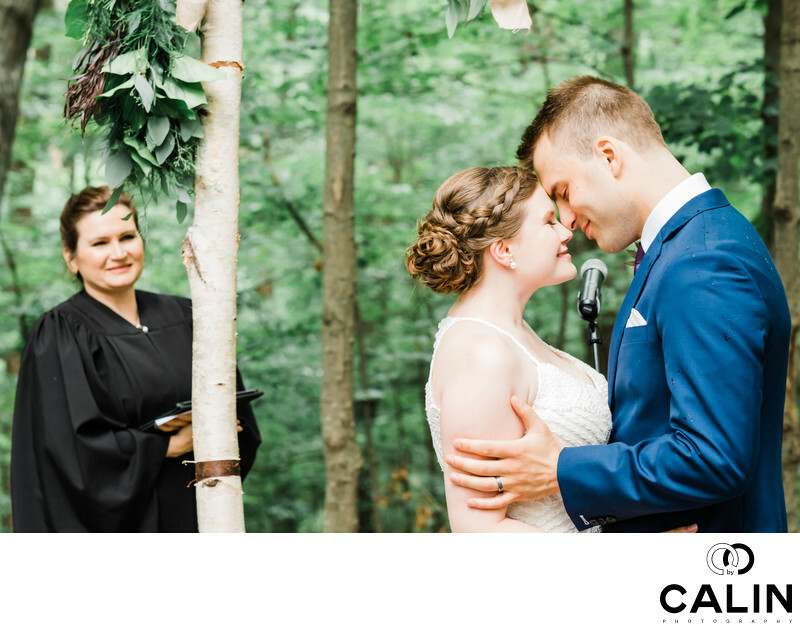 When she noticed the couple touching for heads she stepped to her right, smiled and looked at the newlyweds allowing me to take one of my favourite photographs at Kortright Centre for Conservation.